This is a picture of a Gurudwara, a Sikh temple across the street from Pulao’s family’s flat in Delhi. Pretty, no? Majestic and holy? It may look nice, but the Gurudwara has loudspeakers — two speakers on each corner of the temple, pointing out. Pointing across the street. Loud loudspeakers. At five in the morning our first day here, it seemed that people from the Gurudwara were shouting in my bedroom. The Sikh priest was leading a call . . . The other night at the bar, two of our friends tried to tell Pulao and me about a practical joke called “doortricking”. Of course it turns out that “doortricking” can only be confirmed to have been done twice in the history of the world . . . both times by the same guy that they . 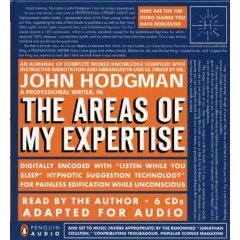 . .
As of 2:49 PM CMT, John Hodgman’s The Areas of My Expertise audiobook is available as a free download on iTunes. But for how long . . .
You may have seen Hodgman as the winning, deadpan, occasional correspondent on The Daily Show. He’s also been recently immortalized as “PC” in the back-and-forth PC v. Mac ads. The book, my friends Dan and Salma say, is hilarious. 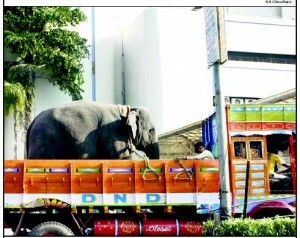 I’ve got my download, hopefully ready to make the long, long flight to India seem a . . . The other day I went to the doctor to get some shots for my upcoming trip to India (Pulao and I leave Xmas day for a long vacation to her parents’ homestead in Delhi). Although there’s not much risk of malaria in Delhi, my doc says its pretty standard to take some kind of malarial prophylaxis when visiting India. OK, I say. This sounds to me like the intro to a parable, or a joke. “What are the side effects for the . . .
Because coming of age is boring unless something else is going on.